An Englishman in Colombia: Relaxing Week! It's been a more relaxing week, I haven't been able to do a lot, because I have been suffering with constant headaches, worse when I lie down, so in case I did more damage than was thought when I had my fall, I have agreed to go and see a Doctor again, my own Doc is that popular, there are no appointments until January, so I made the first available to see another, next Thursday. the one thing I don't like is that by law you have to have the registration number of your bike on the back of your helmet in transfers, it doesn't look good, and doesn't make sense, especially if you ride more than one bike. The down side to not having the registration number on your helmet, is that your bike can be seized, and you receive a stupid fine. My old helmet was one I brought from Spain, and the interior had gone solid like a rock inside, giving me headaches from the pressure. 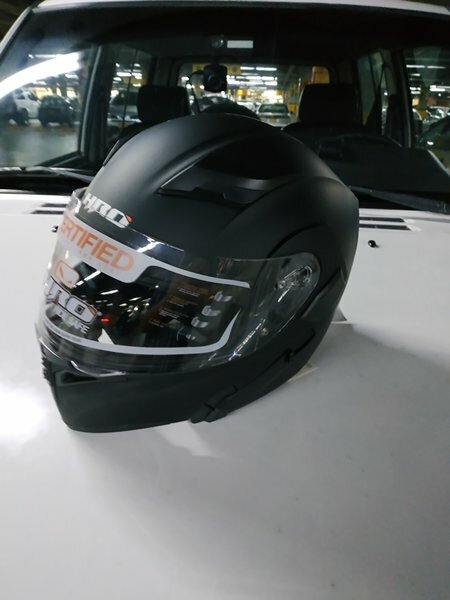 I made sure that the helmets were DOT certified, Colombia also has it's own certification, but I have more confidence in DOT. Marcela now also has an armoured denim motorcycle jacket, and I bought a 'Grip n Ride' belt, so that Marcela feels more secure on the back. This goes around my waist, and there are a number of gripping options available. I had one back in the UK many years ago, and they work. I am looking forward to us going out, we will be fair weather riders, when out together, so may have to wait a week or two before we venture further afield. The climate is definitely changing here, it is warming up, so summer is not too far away thank goodness, it will be nice to have long hot days back again for a while, I've had enough of the rain for the time being, saying that, we probably still have it especially at night, for another week or two. Yesterday, Marcela and I went out together to do the shopping, as she needed a prescription, and for that you have to show your ID, we then went on to Niquia and bought the paint to redo the Mother-in-laws lounge, I am hoping to get that done next week, white with a coffee coloured accent wall (her choosing). Today, Marcela will be cooking, preparing meals for the week, she doesn't believe in sandwiches for work, so takes a meal, heating it up in the microwave. I on the other hand will be pottering, I need to do some painting outside, but until the weather is a bit drier, there is no point, as it will just be washed off in the first tropical storm. Once the weather turns, as we have yet to get a buyer for the house, I may finish the floor of the swimming pool. Until then I will do what Retirees should do, make the most of my time and relax!